I live in a tiny house. But it has a big garage. I used to keep my car there, but my mini-van is too long to fit! The garage has now become my de facto project headquarters. When the holidays roll around, I create “Santa’s Workshop.” I set up two folding tables, pull out my collection of gift wrap, ribbons and tools. 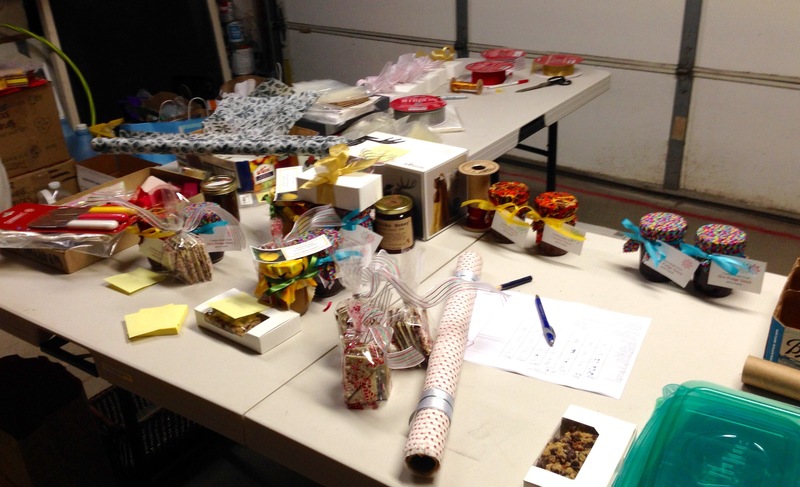 For 10 days to 2 weeks before Christmas, I have everything in place to sort, wrap, and package the gifts I’m giving. As soon as the holiday is over, everything is stored — in the garage — for next year. Keep a small box — 6 qt plastic shoebox — filled with the tools you need for wrapping: scissors, tape, markers, pens, gift tags, twist ties, etc. Keep the box filled all year so you won’t scramble when the holidays roll around again. Write a check list of all your recipients and note each gift you are giving them. There’s nothing worse than finding the extra gift for Uncle Fred still in the back of the closet weeks after the holiday. This is especially handy for baked treats so you know who gets the jam and who gets the salty caramels. If you are shipping gifts, give yourself plenty of lead time. Even better, use the USPS flat rate Priority Mail boxes. You can print postage online, tape it to your package and let your regular mail carrier pick it up. Remember the spirit of the holidays and keep it centered in your heart! Previous post: A Solution To Holiday Panic!